Speaking of the stream though, it was frustrating to have it cut out with about 10 minutes left in the game. I got it back with two minutes to go and then lost it again, only to have it back when Jukka Jalonen was shaking hands with his assistant coaches after winning the game. The YouTube comments that run next to the IIHF Video stream were understandably filled with rage when the image cut out. Finland has now had numerous power play opportunities in the two games it has played but has not mustered anything on them. The power play, as far as I can see it, is about nifty puck movement but there is not enough shots coming in on goal and the players are not quick enough to react to second chances on the rebounds. Somehow I feel that the guys are trying too much instead of keeping it simple. Whether it is the pressure of playing in front of a home crowd that’s getting to them or the 24/7 TV access to training and whatnot that is disturbing the flow of the game, but I have a feeling that there is something not quite clicking with the team yet. If we look back to last year, Finland did have a slow start to the gamest then as well, but at least the team was scoring more goals in the first couple of games. I don’t know if the puck control game, or “Our Game” thesis that Jukka Jalonen is coaching with is causing the lack of scoring. Where I think that the style of play suits Finland from the point of view that the team is controlling the puck and flow of the game there is always that little bit that makes me think that they should be more direct and drive hard to the net. On many of the offensive rushes that the Finns have had are like a throwback to Juha-Matti Aaltonen’s playing style. Drive hard from the boards and go behind the net. The Finns are trying to use Gretzky’s office as a place to create offence and there’s one player who can do that on the team and it is young Granlund. He dished out a nifty pass to Pesonen from behind the net. Pesonen fluffed the first shot but made good by getting his backhand shot to go top shelf. Whatever it is, the team has to start scoring and playing a more up-tempo game as now it looks more like the players are going at walking pace on the ice. The opponents will only get harder as we are yet to play USA or the party-hard Canada team. Finland has to improve drastically for those games if it is to have any kind of hope for a repeat of its world championship. You simply do not win championships by scoring one goal per game. That is unless you are a soccer team and you score one goal and then go into a turtle defence mode. But that’s not the way hockey is supposed to be played like. The goalies have both been solid. Vehanen dropped the puck a bit more than Lehtonen, but a shutout is a shutout. It poses an interesting problem for the Finnish coaching staff as to who to play more in the games, with both goalies being in good form and with Karri Ramo waiting on the wings. I would expect that Jalonen realises the fact that he can’t have his team score only one goal per game and expect to go to the finals. He definitely needs to get more out of the power play and from Jussi Jokinen, who has been terrible in the first two games. Jalonen needs to also work on some issues that the Finns have on normal 5on5 game. Good thing is, we have not (yet) seen anyone talk about the old Finnish adage of “Scoring is difficult” or “we had this many scoring chances in the game” it’s not the chances that win you the game, it’s the goals that you actually score. The ticket price debacle goes on and I fear that it is going to be the thing that is most remembered from the 2012 World Championships. Yesterday, the Finnish organisers said that they are not going to be lowering the ticket prices to the games following Sweden’s announcement of 70% slash in prices. The organisers are saying that there have been plenty of tickets sold and even went as far as to claim that the Finland vs Belarus game was sold out. However, the prices continue to be a thorn in the fans’ side. Some tried to stage a protest against the prices in the France vs Kazakhstan game. However, from the opening game between France and USA the organisers had barred the display of banners that were larger than 1mx1m, though if the rule applies to all banners displayed, shouldn’t the organisers ban the display of national flags in the stands as those are bigger than 1mX1m. There was one banner displayed in the Hartwall Arena saying “Kale Hinnat Alas, Kale on varas” loosely translated to Kale, lower the prices, Kale you’re a thief. The banner was visible for five seconds before a group of security officers descended on the group displaying the banner and “kindly” asked for the group to vacate the premises. Though the group was later allowed back into the stands sans banner, it still says a lot about the way that the organisers are treating the fans. 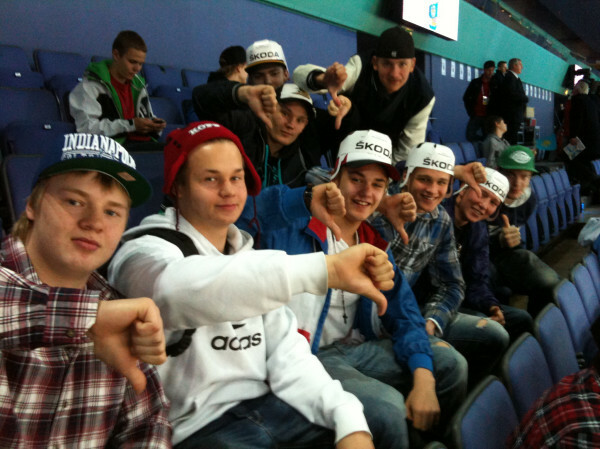 As you can see from the picture below, the group of guys is clearly happy about the prices and of the treatment they have received in the games (Picture courtesy of Esko Seppanen: https://twitter.com/#!/EskoSeppanen) . The organisers clearly have a stand of “No opinion will be listened to unless it is the approved one by the organisers”. I know that may not necessarily be the case, but that’s what it looks like to me as a spectator and lover of hockey. In my humble opinion, the games have turned into a joke. Not because of the hockey but because of the fact that the games are played to half empty arenas and the organisers have adopted a “we will not negotiate with terrorists” policy. I guess if the organisers lower the prices it is them admitting that they got it horribly, HORRIBLY wrong. If Rene Fasel, the guy at the top of the IIHF admits that the ticket prices and the debacle around them is not good advertisement to hockey or to the tournament, there should be alarm bells ringing at the organisers’ office. Oh I forgot, there has been alarm bells ringing and they have admitted that they’ll take these games on board and rectify things for next time. Why next time? Why not now? Is it that bad to slash the prices to games so that there would actually be FANS in the stands cheering the games? 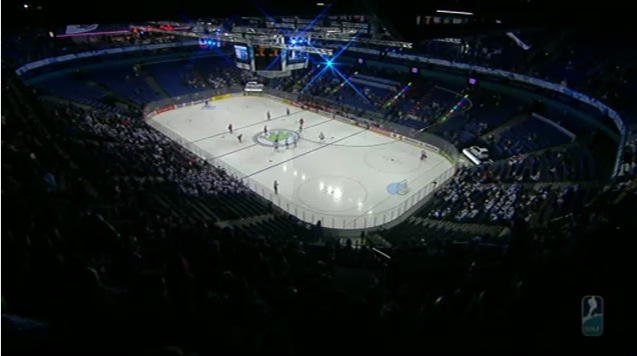 It is ironic that the France vs Kazakhstan game has attracted more or less the same audience as the USA vs Canada game from yesterday and that it is LOUDER in the arena than it was during Finland vs Belarus or USA vs Canada. In either case, I think Finland and the Finnish Ice Hockey Association will have to wash its face for many months after the games. I’d like to see what some of the stars who are playing in the games think about playing to an empty arena. I know Pavel Datsyuk didn’t seem too happy about the attendance figures in Stockholm and I guess playing to a dead crowd is difficult for the NHL guys who are used to playing to a sold out crowd for the entire season. For the sake of hockey, I hope that the attendance will get better and that there is going to be cheering at the games. However, something makes me think that this is not going to be the case. The IIHF Ice Hockey World Championships are just around the corner. In the host nation the anticipation for the games is at its peak. The reigning world champions are hosting the games with Sweden and Finland is ranked at number one at the IIHF rankings. Not bad for a nation of 5.5million and who have only won the world championship twice and is eagerly waiting for its first Olympic gold medal (no pressure guys). However, one thing that has actually hit me quite hard after reading an open letter by the editor of the Finnish Urheilulehti. The editor, Esko Seppanen, criticises the Finnish Ice Hockey association’s chief, Kalervo Kummola over the pricing policy of the games. Harsh words on the eve of the games in a nation that has seen a huge boost in hockey since last years’ World Championship finals. In fact, the hockey boom was evident in nearly every news outlets’ reporting. The local professional league Sm-Liiga was covered more widely than ever before and attendance was up, not to mention the emergence of some of the greatest young talents the Finnish hockey system has produced in years! Even the NHL was covered to the point that it didn’t matter whether a team had any Finns on its roster. This maybe a slight over exaggeration, but this years’ coverage has been a real pleasure to follow and it feels like for the first time in years that hockey is generating discussions around the water cooler again. Every time I visit Finland, I am confused of the TV packages and what provider offers what channels and what bolt-ons one would have to buy to get the channels that show hockey. Trust me, I feel sometimes feel like you need a degree in astro-physics to make sure that you get all the games. What I have learnt is that in Finland Nelonen Pro shows the NHL. For the World Championships the TV rights for the games were sold to MTV3 from Yle (think of Yle like the Finnish BBC). With MTV, I have no idea what channel in its vast plethora of pay to view channels the games are going to be shown on. It is incredibly confusing. Imagine if you are a tourist and want to catch a game in your hotel room. Chances are the hotel doesn’t have the channel on its channel list, or then there is the option of calling reception to ask what channel a game is on, go to a bar to watch it, or just simply give up. But what of the ticket prices themselves then? One would like to think that Finland being the reigning champion and the games being hosted in Finland (and Sweden) that the prices would be competitive and comparative to the other World Championship tournaments. Well, according to the letter by Seppanen a family of five would have to pay €1000 ($1,320) to go see Finland vs France. A THOUSAND Euros for Finland vs France. Comparatively, tickets to Canada vs USA would cost €196 ($258) and the semi-final would cost from €175 ($231) to €226 ($298), though I have seen a tweet of someone getting a ticket for the afore mentioned CAN-USA game for €40. I need to take a breather here as I’m about to faint from just looking at that. How can a family of five afford a €1000 in this economy to go watch hockey, not to mention all the other expenditure (parking, refreshments, merchandise etc etc) associated with a trip to a hockey game. To some the €1000 is half of their monthly salary, if not all of their monthly salary. As Seppanen points out in his letter, it would be cheaper for that family of five to go watch the Champions’ League Final in Munich than to go watch Finland play France. In fact just to put it into perspective, I saw someone tweet earlier in the week that in 1998 when Finland last hosted the World Championship, they were able to buy a ticket to the final in the black market for €90. That’s cheap for a ticket to the finals… on the black market. I dread to think what a single ticket on the black market would cost to go see the 2012 finals. And yet, Kummola has the audacity to wonder why the tickets aren’t selling as expected, or proclaim that the prices are on par with NHL regular season game prices. Well, him and his peers have set the prices and it’s too late to back out now. If I was to go and watch the games in my native Finland, I would have to shell about €250-300 on flights alone and then pay almost the same to go watch Finland play France? Give me a break. I love my hockey, I really do, but there has to be a line somewhere. For those kinds of prices, I’m expecting that I would be treated like a royal. I would rather use that money and go on holiday somewhere. At least the holiday would last longer than 60 minutes. I really do feel bad for hockey fans in Finland and those foreign fans who have paid a top dollar to fly over to support their nation in the games. It is a huge expenditure just to watch a few games, not to mention the fact that Helsinki isn’t exactly the cheapest capital city in the world. Don’t get me wrong, I like Helsinki, but it is expensive. I fear that the cheapest way to watch the games for any fan would be to buy their nations’ game package from the IIHF website, hook their laptop to their TV and put the radio on for commentary. That’s what I’ll have to resort to as there is no way that I can justify spending what would be probably two month’s wages to go watch some hockey, or less if I just wanted to soak up the atmosphere. I don’t know whether we’ll see a colourful cavalcade of fans at the games, like we are used to with the World Championships, due to these prices or whether we will have arenas full of men in suits. I for one want to see people decked out in quirky outfits and that dude dressed in the cat costume drinking a (blow up) bottle of Fisherman’s Friend flavoured vodka. I hope that the games will be entertaining and that people will fill the arenas as otherwise the games might go down in history, and not in a good way. My fear is that this will leave a massive brown, smelly stain on the Finnish hockey credibility if the games are not sold out. Could you imagine either the semi-final or final that would be played to a nearly empty arena? Thanks to Esko Seppanen at Urheilulehti (www.urheilulehti.fi and http://www.urheilulehti.fi/jaakiekko/leijona-liput-hapeallisen-kalliita-kummola-vaihtoi-aidot-faninsa-kylmasti-rahaan) for permitting me to quote and paraphrase his article. You can follow Seppanen on Twitter at: https://twitter.com/#!/EskoSeppanen (tweets mainly in Finnish). Also thanks to Teemu Lindfors (https://twitter.com/#!/TeemuLindfors) and Jan Johansson (https://twitter.com/#!/JanPPa) for ticket price information. You have shockingly abandoned the Finnish hockey fans with the ticket prices at the World Championships. You have coldly shown that the fans mean nothing in this money making scheme. You have also shown, that ticket sales are just a part of the whole concept. Mr. Kummola, if we are honest, ticket sales have nothing to do with the games. It is only a plus in your cash flow at the end of the games. Look around you and you’ll understand. The tournament in Helsinki starts next Friday (4th May). Have you, Mr. Kummola, seen a SINGLE advertisement that would sell TICKETS to the tournament itself? No, no you haven’t. Neither have I – or anyone else for that matter. What have we seen? This is what we have seen, however, perhaps more now than at any other point in time in the Finnish sporting history. Regardless of what Finnish website you visit, you will see advertisements for the TV packages. You will not see a single advertisement that would encourage you to buy tickets to see a game. How can this be Mr. Kummola? When you shrewdly out-priced the “people” out of your games, you are in the position where you can sell your TV packages for prices that don’t look half bad to the average consumer. If a family of five went to your friends’ Arena to watch Finland – France match, the head of the family would have to pay over a thousand euros for lower level seats! And you have the audacity to wonder why the tickets aren’t selling like hot cakes. Did I forget to mention that the TV Package providers are the biggest sponsors of the Finnish Ice Hockey Association? Your goal was never to allow the average income fans to the games at all. That is why you have bolted the doors shut to the average Joe at the Arena. You know full well that the family of five’s wallet will choose the TV package rather than pays a THOUSAND euros for ONE Finland – France match. Unbelievable. This letter will carry on in the Urheilulehti World Championships special, which goes on sale on the 26th of April. I know Mr. Kummola, that you do not care. But the Finnish hockey fan does care!